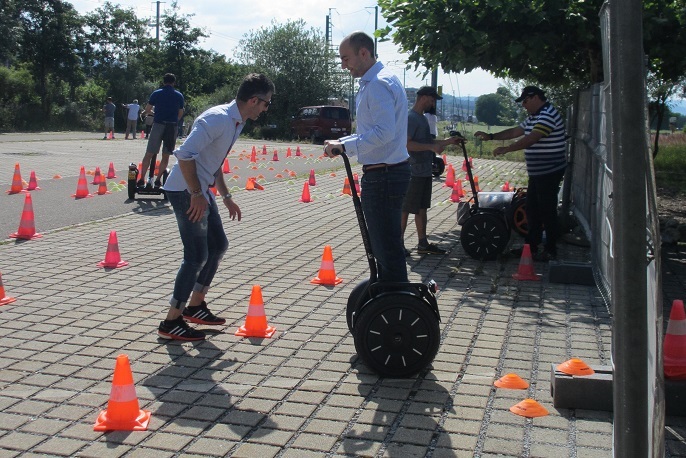 Control the self-balancing, uniaxial vehicle simply by shifting body. The Segway adventure course is the perfect opportunity to try out this fun and trendy two-wheel vehicle with its agile riding style. To start with, you will be introduced to the technology of the Segway by a Segway expert before you then try your first ride yourself. On the individually assembled adventure course you will then prove your riding skill and also observe that of the other Segway enthusiasts. Start with slalom, drive back and handfree. Also very popular ist the E-Polo. The game became famous played on horseback but Segway polo is also becoming increasingly popular. Here you ride an "e-pony" (the Segway) and aim to get the ball into the goal with a mallet. 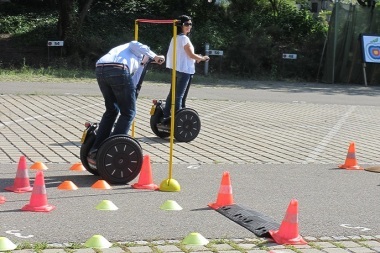 E-polo can be included in the skill testing adventure course or held as an individual event. The space requirement and the number of vehicles is hifher than on the adventure course. With its electronic motor which doesn't produce any emissions, the Segway adventure course can also be held indoors − the minimum space required is 10 x 15m. Exhibition or seminar rooms are suitable. Inspire your guests with a Segway adventure course and let them experience driving on the Segway as they wish. Ideal between seminars, as a complement to a celebration or as an attraction at a day of te open door. Set up / disassembly of the course, helmet, supervision by experienced Segway guides. nothing in particular, no driving licence necessary. Enjoyment in new things. You can use the Personal Transporter for a Segway ride. For larger groups we recommend a combination with the mobile minigolf. Casual clothing, comfortable and sturdy shoes (no high heels! ), wind and rain/waterproof jacket, sunglasses.